21 MEMBERS. 5 HOURS EXCHANGED. We (Victoria Bellotti at the Palo Alto Research Center, John M. Carroll at Penn State U. and Anind Dey at CMU) are conducting research into requirements for technology to make peer-to-peer (P2P) service transactions more efficient. The technology we plan to develop will collect information from your actions online or on a smartphone and from the environment to make recommendations for transactions you can participate in as a service provider or receiver. In the future, our technology will work with this system, hOurworld, which stores logs of user transactions for anonymous analysis by scientists. By joining and using this system, you are consenting to collection and use of anonymous data from these logs of your use of the system, which we will use as a baseline for measuring the impact of our innovations. You may also receive email updates (no more than once a week) which may include an invitation to participate more fully in our research by allowing us to collect more data on your use of the new technology prototype in exchange for an incentive payment. 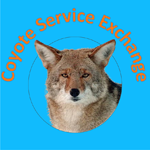 Welcome to the Coyote Service Exchange. This service exchange is being used for studies of technologies that will turbocharge the adoption and usefulness of peer-to-peer services. See "Brief Informed Consent" notice to the left of this panel. hOurworld has over 20,000 members in over 200 exchanges across the US and the UK. The Coyote Exchange is for Palo Alto and the surrounding area. It may not be the closest exchange to your location. Please check here (https://www.hourworld.org/) to see if there is one closer to you. Users of this service must be 18 years or older. We will send email to users with updates or study participation invitations. This will happen no more than once a week and probably far less. Questions about research activities associated with this service exchange can be emailed to Victoria at bellotti@parc.com. Detailed terms of Service can be found in the TOS link at the top right of this page.